Love is patient, love is kind. This tungsten carbide ring twice embodies the best of both worlds: the physical and the ethereal, and the stylish and the meaningful. 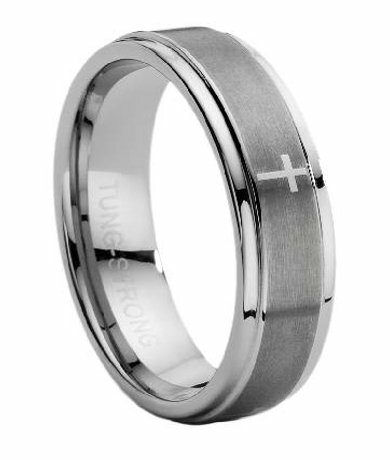 A stunning silver wedding band from afar, the laser-etched cross is visible upon closer inspection, a pleasant and reassuring reminder of one's commitment to oneself, to one's marriage, and to the Lord. Comfort fit tungsten rings usually run 1/2 size larger, it is suggested you buy a half size smaller than your standard ring size. We recommend having your finger measured for a comfort fit ring at your local jewelry store for an accurate fit. All of our tungsten rings come with a lifetime warranty. Love the ring only wish the cross was as pronounced as it shows in pic. You have to look really hard to see it. This ring is beautiful. You won't be disappointed! My husband loved his ring, even though it is temporary. Very thankful for it. Beautiful finish and feels very comfortable. Pay attention to sizing! They recommendation ordering a half size less than your normal ring size and this is very accurate. The picture does not do this ring justice! It's absolutely beautiful! I love it! The cross is faint but it's so well done! I'm so happy! I can't wait for our wedding day to come so I can put it on his finger!